For CoreAFM the CoreAFM advanced spectroscopy option is recommended. For systems with the Easyscan 2 controller the advanced spectroscopy option is recommended. For systems with the C3000 controller the advanced spectroscopy package and the cantilever calibration option are recommended. For NaioAFM, the advanced spectroscopy and calibration option is recommended. Without the respective options, only qualitative experiments can be performed due to missing cantilever calibration capability and the lack of max. contact force control for each force curve. 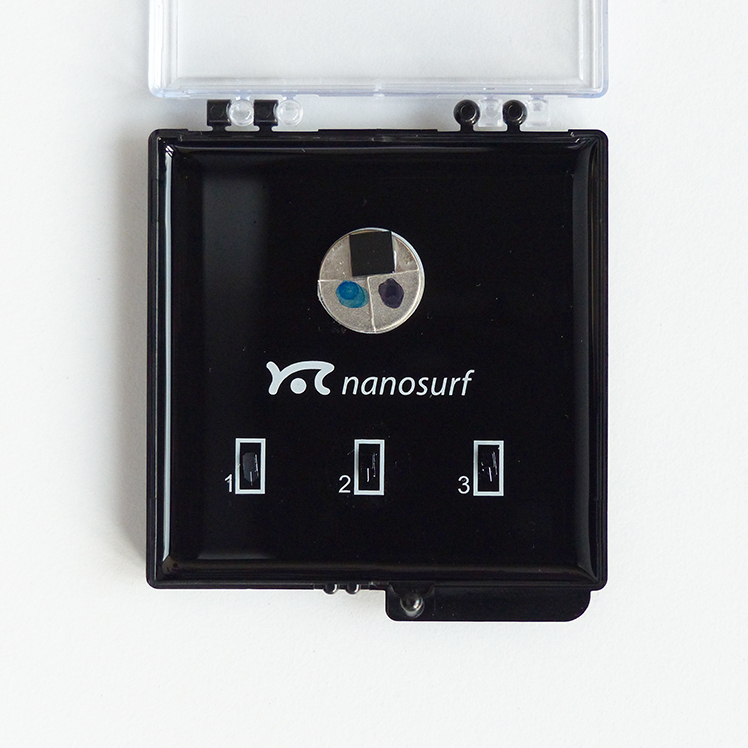 The Standard spectroscopy mode kit provides three samples on a single sample support - a piece of silicon wafer and two pieces of different polymer gels. The polymer gels show a marked difference in their elastic moduli (nominal 650 kPa vs. 1.5 MPa) as well as adhesive properties. The sample can be used to learn setting up force spectroscopy experiments and subsequent analysis of the resulting force curves. Elastic modulus and adhesion maps (5 µm x 5 µm, 128x128 pixels) recorded on the soft and stiff polymers. Maps were analyzed using SPIP software and the DMT‡ model for the elastic modulus. Histograms of the elastic modulus and adhesion force distributions of the soft and stiff gels. Normal distribution fits to the histograms (gray- and blue-dashed lines) result in mean elastic moduli of 560 kPa and 1530 kPa. The inset in the upper histogram shows a typical force curve (blue-forward; red-backward) with a DMT‡ model fit on the backward curve (black dashed line). ‡)Force-distance curves recorded on the polymers of this sample show significant adhesion. Although the DMT model assumes a spherical intenter geometry, it was used to account for adhesive interactions between tip and sample. The Sneddon model, which would describe the indenter geometry more accurately, does not account for the adhesive interactions. While the polymer samples of this kit are used to demonstrate differences in the material properties, the silicon sample serves as reference for cantilever calibration. In order to quantify the forces exerted and felt by the cantilever, the cantilever deflection sensitivity and spring constant have to be determined. Deflection sensitivity determination can be achieved by pressing the cantilever against a hard surface such as here silicon. The spring constant can be determined using the method developed by John Sader and colleagues. The required information about the cantilever dynamics can be extracted from both the thermal cantilever motion or a frequency sweep. Following calibration, the system is ready for measurements. You can find some examples of force spectroscopy measurements used to investigate the elastic properties of e.g. cells, soft hydrogels, polymer coatings, and polymer mixtures. Moreover, force spectroscopy can also be used to probe single molecules.